Megan Williams, who was seriously injured in a Lakefront Trail crash, called it the best Christmas present she could hope for when Mayor Emanuel and the Chicago Park District announced hedge fund manager Ken Griffin donated $12 million to the city to create separated paths for people biking and people on foot along the full length of Chicago’s Lakefront Trail. 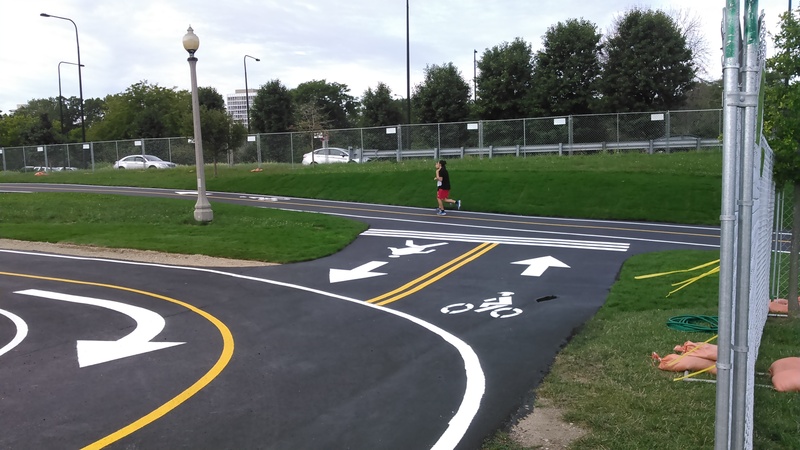 The Mayor had announced in March that the trail would be widened and split into separate lanes on two of the most congested segments on the South and North Sides, while planning for separation on other segments. The city said Griffin’s donation will allow the Park District to complete separation along the full 18-mile trail in 2018. This year’s progress comes after decades of trail advocacy by Active Trans and our community partners, including the Chicago Area Runners Association (CARA) and Friends of the Parks (FOTP). Lakefront Trail congestion is one of the most common concerns we hear about, and the public overwhelmingly wants people on bikes and on foot to have separate trails. We cannot thank Mayor Emanuel, Mr. Griffin and Park District Commissioner Kelly enough for their leadership to achieve one of Active Trans’ top priorities. According to the Park District, the bike trail will be 12 feet wide and made of asphalt. It will be located closest to Lake Shore Drive. The pedestrian trail will be 20 feet wide. It will include 14 feet of asphalt buffered by 6 feet of “soft surface mix” on either side. Since 2014, Active Trans has been providing advice and recommendations to the Park District on how to ease congestion and conflicts on the trail, with a focus on creating separate trails. More than 1,700 people signed our 2014 petition to city leaders in support of separation, and we worked with Lakefront Trail crash victim Megan Williams to call for separating the trail at park district budget hearings and in local media. It's impossible to assign blame for Megan's crash but she recognized the best way to prevent future crashes was to upgrade trail infrastructure so everyone can travel safely. In his remarks Wednesday, the Mayor said meeting Megan earlier this year and hearing her story was one of the biggest reasons he decided to pursue this goal so aggressively. In 2011, we worked with the Park District on a study of trail usage that featured the most in-depth trail user counts to date. The study found more than 30,000 people visited the trail daily at the busiest points, and we estimated more than 100,000 used the trail on a typical summer weekend, making it one of the busiest trails in the U.S.
Those counts became the foundation for our 2013 People on the Trail Report with CARA and FOTP. The report analyzed results from a survey of more than 1,500 trail users, bringing attention to the highest conflict segments of the trail and identifying separation as the top priority for users. Active Trans cannot fully evaluate the city’s plans as we have yet see them in detail. We will continue to work with the city to ensure leaders effectively implement improvements and continue to upgrade trail infrastructure. Join our supporter list to stay up to date on our Lakefront Trail work and other advocacy priorities.